On the train to Lisbon. We awoke in Lisbon, then watched Lisbon wake up around us. 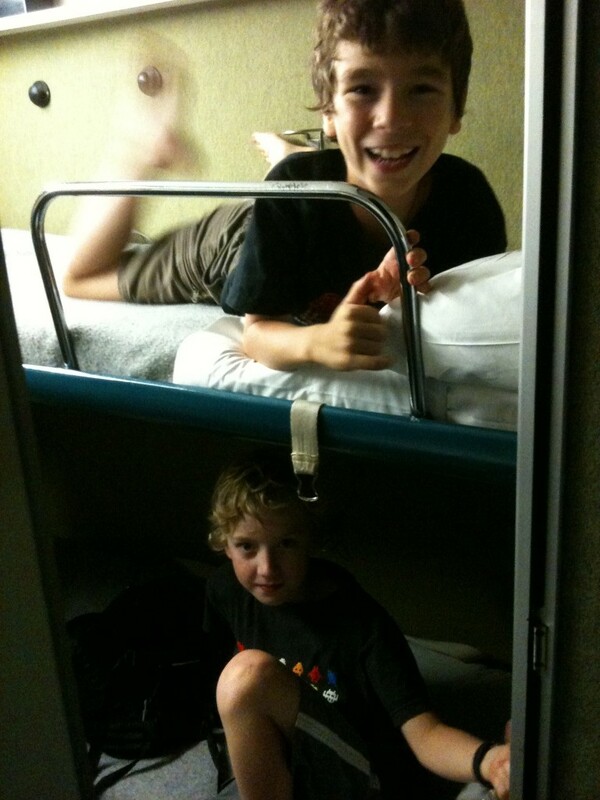 The train from Madrid was remarkably comfortable. Given we didn’t pull out until 10:30 the boys went to sleep almost instantly and managed a reasonable night’s sleep. For the first time we had a compartment all to ourselves which helped with sleeping because we didn’t have to remain quite so alert for comings and goings. We’re all a bit tired though. 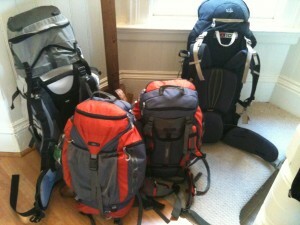 We arrived in Lisbon at 7:30am and walked to our new apartment. The owner let us in and we left our bags but we had to go and amuse ourselves while the apartment was cleaned. 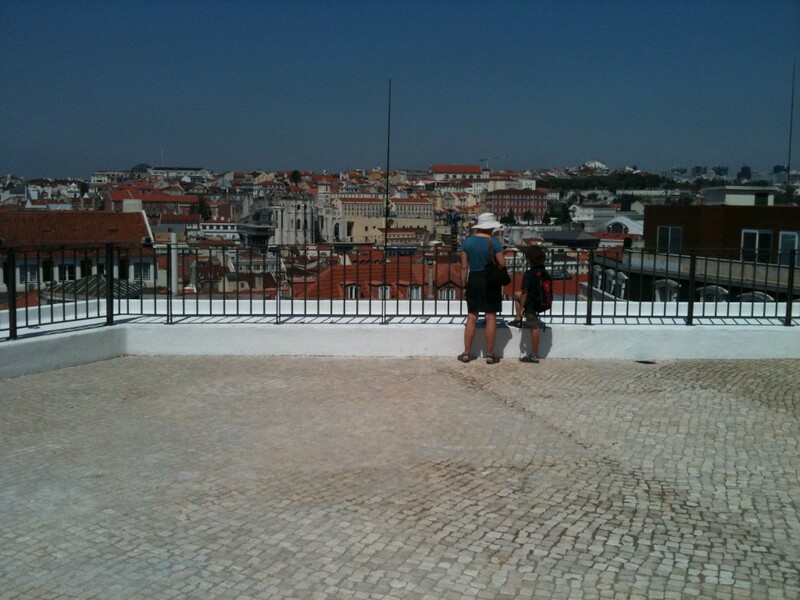 The apartment is in the Alfama area which snakes down the hill under Lisbon’s castle. 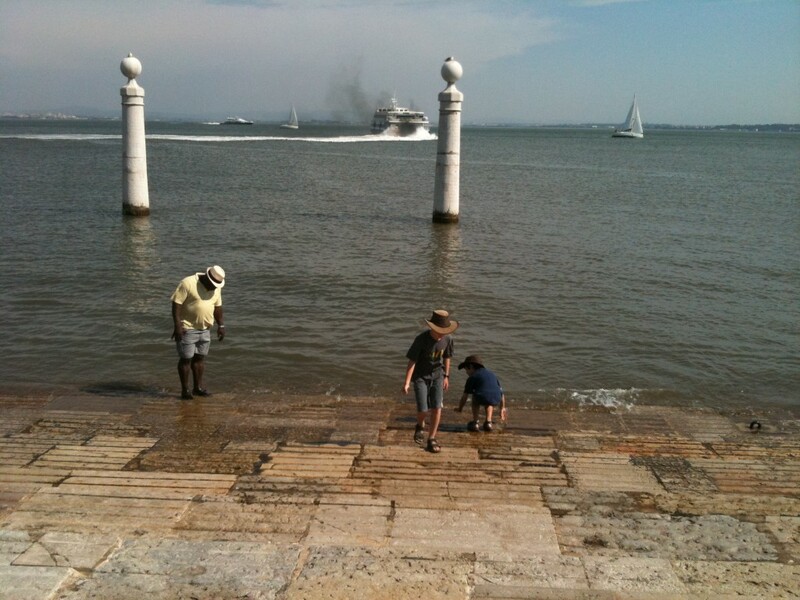 We’re right down the bottom, near the water and a short walk to the grand plaza and gate that mark the entrance to the reconstructed city of Lisbon. It made a particularly appropriate way to welcome ourselves to Lisbon, walking through the gate into the neatly laid out streets of the town. Lisbon was massively damaged in the Great Earthquake of 1755. The reconstruction made it one of the first planned cities and it was for a while the envy of Europe. The centre of town is a grid of largely pedestrian areas surrounded by routes along which lovely little trams trundle. Of course it was still ridiculously early for Lisbon when we walked up into the town looking for a cafe and so the streets were deserted. 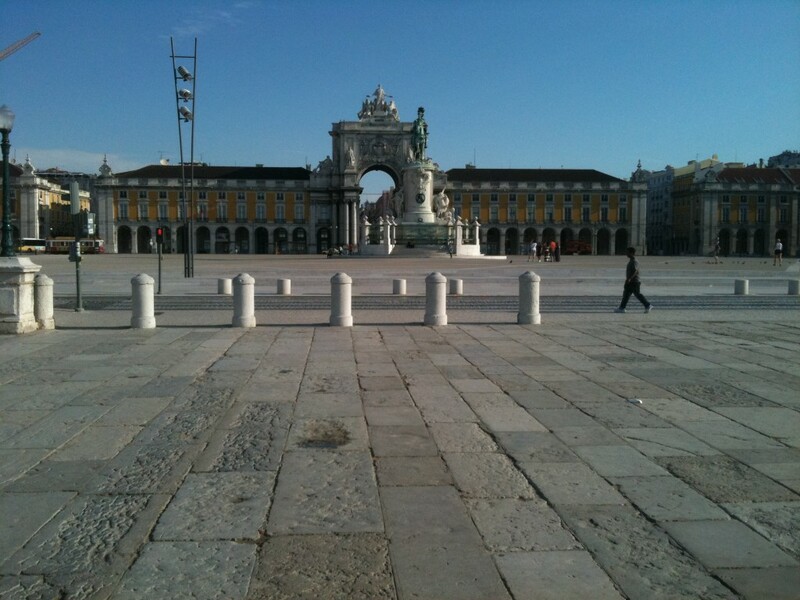 We spent the next couple of hours having a leisurely breakfast and watching Lisbon come slowly to life. At least around here it seems a friendly and busy town. There’s a lot going on, but much of it revolves around the tourists who crowd in from cruise ships and other parts. There are, noticeably, a great many homeless people and beggars about too, which we presume is a tangible sign of the economic mess in which Portugal finds itself. Eventually we felt awake enough to have a bit of a stroll up to the castle for a view over to the harbour and then popped back to the apartment. One of the weekly chores that there’s no escaping in a new place is finding a supermarket. Rarely this has been a simple process, but more usually it’s fiddly at first. One reason is that the person opening the flat for us often doesn’t know where the local supermarket is because they don’t live in the flat, or they have a car which makes for a completely different dynamic. Google can help, but it generally means some serious research rather than a simple direction. The situation is exacerbated when we arrive on a Sunday. So it took us some effort to track down our groceries today and we deserved our reward of ice-creams and Portuguese tarts. We finished our exploration by having the boys dip their hands in the sea. We realised that this was the first time they’d touched the Atlantic Ocean. From my carpool, geologist at the wheel, years ago: At that time I think the Lisbon quake of 1755 was recorded as close to the highest Richter Scale event ever. Of course that is not exact. The instruments and scale were still not invented. Without the instruments you need to use the damage at various distances as a scale for comparison. Christchurch shows that you need instruments on the ground to get dependable readings. It was also remarkable in another way. It is not on any ‘standard fault line’. Apart from that bit of ‘form’ no geologist would predict a quake there. There was, from another memory, a considerable clerical input to local discussion naming various local customs that had earned the divine displeasure on display.